1. Remove the tentacles from the squid and, using a sharp knife, cut away and discard any cartilage. Cut the squid in half lengthways. Lightly score the inside of the squid and the skin of the sea bream. 2. Place the tentacles, squid and bream into a large bowl with the prawns. Add 3 tbsp of the oil and the creole seasoning. Mix well to coat evenly. Cover and leave to marinate in the fridge for at least 30 minutes or for up to 2 hours. 3. Light the barbecue or preheat a griddle pan over a high heat. When very hot add the seafood – if your barbecue rack has widely spaced bars, cook the fish on a preheated large roasting tray. Cook for 3-4 minutes, in batches if necessary, turning often and basting with the marinade, until the bream and squid are opaque and the prawns are pink and cooked through. 4. In a clean bowl mix the lemon juice, parsley, garlic, remaining oil and a little seasoning together. 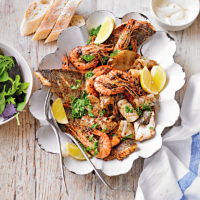 Place the hot seafood onto a warm serving platter and spoon over the dressing. Serve immediately with crusty bread or fries, a dressed green salad and mayonnaise.